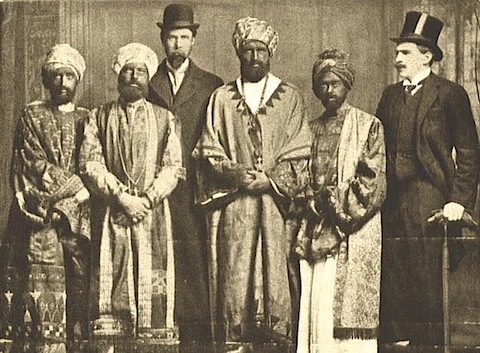 On February 7th, 1910, Virginia Woolf (then Virginia Stephen) and five of her Bloomsbury companions—painter Duncan Grant, Woolf’s brother Adrian, Anthony Buxton, Guy Ridley, and Horace de Vere Cole—boarded the pride of the British Royal Navy, the HMS Dreadnought, dressed in blackface and outlandish stage costumes. (In the photo above, from left to right.) 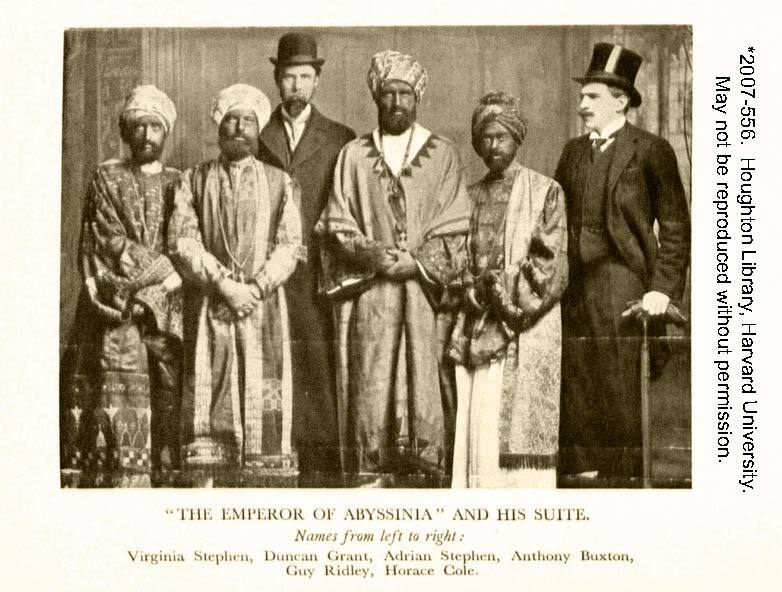 In what became known as “The Dreadnought Hoax,” the six convinced the Dreadnought’s officers that they were the “Emperor of Abyssinia” (now Ethiopia) and his entourage, and they were received with high honors. The hoax, masterminded by Cole, began when he sent a telegram to the ship telling the crew to expect a visit from some North African dignitaries. Once on board, the group spoke in accented Latin (quoting the Aeneid) and gibberish. Woolf kept quiet so as to disguise her gender. One of the officers on the ship was a cousin of Virginia and Adrian, but he failed to recognize them. It wasn’t a flawless performance on either side: at one point, Buxton sneezed and almost lost his mustache, and the Navy, unable to find an Abyssinian flag, flew the flag of Zanzibar instead. All the princes wore vari-coloured silk sashes as turbans, set off with diamond aigrettes, white gibbah tunics, over which were cast rich flowing robes and round their necks were suspended gold chains and jeweled necklaces . . . They also all wore patent leather boots which, Oriental fashion, tapered to a point, the ends projecting fully six inches beyond the toes. White gloves covered the princes’ hands, and over the gloved fingers, they wore gold wedding rings – heavy, plain circlets, which looked very impressive. In a recently discovered letter, Cole wrote to a friend that the hoax was “glorious” and “shriekingly funny.” The group intended to mock what they saw as an outmoded Victorian imperialism, and they succeeded, at least in the popular press. The Mirror published the cartoon above and the Royal Navy was a laughingstock for weeks afterward. 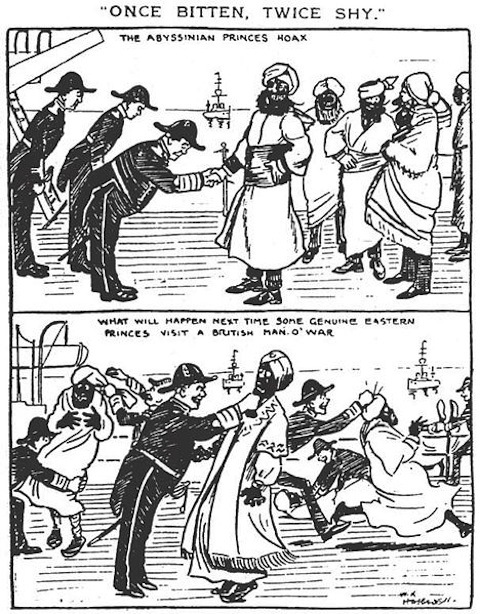 None of this pseudo-racist pranksterism (which reflected just as badly on the officers) struck the actual Emperor of Ethiopia—Menelik II—as particularly funny. When he visited England later that year, he was taunted in the streets by children shouting “Bunga! Bunga!” and denied permission to inspect the navy’s fleet for fear that his visit might cause further embarrassment.